Wow. 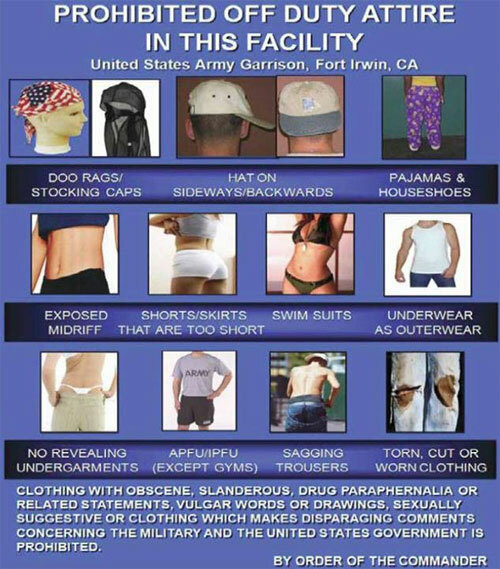 I have NEVER seen a dress code posted anywhere I have been on base and I have never seen or heard of anyone being tossed out of anywhere on base due to their attire. I’d say a lot of the examples in your poster are common sense and I’d never go ANYWHERE looking like most of them, but a lot of people do dress like that in public and I’m sure I’ve seen some of them on base. The problem with the dress code is everyone has a different idea of what it should be. I think that women that go out of the house with more than a regular u neck worth of cleavage should be ticketed for indecent exposure. I think that wearing a polo, shorts and belt to mow the lawn when it’s pushing 100 degrees should be considered endangerment. Finally I believe that I did not give up my right to free speech (via my clothing) when I got married. I may not think pajamas are fit for outside wear, or that you should look like you got your pants from a tent supply store, but it’s none of my business as long as I’m not paying for them. I also think that telling young active duty members that they are adult enough to handle multi million dollar equipment and live firearms while also telling them they are not smart enough to pick out their own off duty attire is ridiculous. there is nothing wrong with being presentable it is never outdated. I agree completely with the prohibited off duty attires on the poster. I probably would remove torn clothing (fad worn by many young people) as well as hat on backwards. I feel people should take a minute to get dressed before going shopping. Pajamas and slippers as well as droopy pants are some of my favorite pet peeves. I totally agree. People have lost their self respect. Pajamas are for for home, and not for public use. Morals have become very low in this country. We need better standards and Roll Models. its bad enough to see people dressed like this, but unexpected on base, I respect my neighbor to be dressed properly…and I expect my neighbor to repeat me, and not look like trash. A properly dressed person is the attractive person, doesn’t look like trying to ear a few extra bucks by their long hung slacks showing their underwear, or a too tight stretch top, what kind of beauty is this. what a person is saying, I’m cheap. as if we didn’t know.. I thought this was ridiculous for years & my dependent husband couldn’t wear a baseball cap to the gym?? Folks let’s use common sense please. I was screaming inside my head one time when the base had an all hands about the dress code & guess who shows up in a lingerie type top? The SgtMaj’s wife! I thought it was an opportunity – really to either speak up or test the situation, but the higher ranking dependents wore what they wanted – period. Glad to read this article & hopefully we’ll see some changes that make sense for 2019 & beyond. I have never worn flip flops to take a shower and as a matter of fact I have never worn any kind of shoes in the shower, I have worn flip flops to the shower but they were left just outside the shower to be put on when getting out of the shower. Flip flops are house shoes and never should they be subsisted for sandals. If you don’t know the difference you should try to be more educated. If you understand this no explanation is needed, but if you don’t understand this no explanation is possible. Interesting. California Navy bases must be pretty relaxed because I’ve been wearing workout clothes to the base since 2011 (flip-flops even longer) and have never had anyone say anything. And I don’t just mean leggings. I often go in running capris and a dry fit tank top. Before I work out though, not after. Come to think of it, I’ve never actually seen a dress code posted anywhere. If you are leaving the house to go out in public dress appropriately no matter where you are going. Look in a mirror and if you truly think your mother would approve of what you are wearing you should be good to go. If there is any doubt change your attire. Pajamas are just that, PAJAMAS! Leave them in your home along with your HOUSE slippers. Pull up your pants! NO ONE wants to see your underwear. Put the bill of your cap in the front of your head where it belongs. If I see you dressed in pajama, pants hanging to your knees with a hat on backwards I will assume that you are a child, NOT an ADULT and you never learned to dress yourself or you are too stupid to learn. A dress code should not be needed anywhere in public but it is. I do agree it needs to be updated for the way we live today. NO! Do not change the dress code! I just can’t understand why people would rather look like slobs that look like they not only don’t care about themselves or anyone else. So I say DON’T relax and change the dress code but get back to dressing as the proper adults we know we are and not only show we care about ourselves & others but that we care enough to show good example to all our young people and children. Personally, I dont care what the “trend” today is, nor what people suddenly think is acceptable because they have grown more and more lazy. Its about respect, whether you have none for yourself, as you are simply looking for comfort and whats easy to put on, its about respect of those who dont want to see you dressed a certain way and to ensure a level of professionalism on our bases and in our military community. Seriously, I wish I could get a bill passed to permanently ban yoga pants in public US wide as many are way too tight and they just look inappropriate. Many ladies wear them and they arent even working out, why?.., for comfort, or looking for attention from someone? Its simply not the place to wear at the exchange or commisary. Shower shoe flip flops are what all service members are issued to wear in the community shower to prevent foot fungus bacteria from being easily spread, those style flip flops arent permitted, but in many exchanges Ive been in have become understanding of the difference for 25 dollar flip flops vs shower shoes. If you dont want to follow the dress code, then go be trashy at wal mart and have your picture taken and put online like so many others, the exchange and commisary will not will be fine without your business. I hope no one ever sacrifices respect for some lazy rule breakers money, keep the base clothing order in place! Our military is not a social experiment. It should not be an equal opportunity employer. It’s mission is to defend our nation with the most capable to win. We bleed less in battle. A military base is a bastion of respect, discipline and order which enables it to complete its mission. For over 200 years we have maintained good order and discipline partially through how we dress/present ourselves. “I think the rules should be altered because I am inconvenienced” is not a mission oriented attitude. It is not about you. I have shopped at Military base for many years and never seen anyone dress inappropriately, I don’t see anything wrong with leggings or tank tops, most of us like to feel comfortable while shopping, everyone should dress appropriate by the rules on base,. I think the dress code is wonderful. The military is all about discipline, honor, and respect (or should be). Decorum is wonderful and a form of self-respect also. Pursuing high standards of integrity and good character may be old fashion, too, but is of great value. I feel that clean, properly fitting clothes would be appropriate clothing including jeans for the exchange and commissary including all other branches of services. gym clothes, inappropriate shorts, tank tops and clothes with holes even though it is a new fad of wear including pants being worn low. I say we should always dress so as not to offend anyone whether on base or off. I am a spouse of a 20 year Air Force Sgt. and never had or now have a problem with the dress code! It is a privilege to shop on base so do not change the code to please one or two. They can go shop among the no respect for others and wear whatever! Leggings are for the gym. Not everyday wear. Please people something else should be worn as you can see every lump and bump and bulge in the body. Keep the gym clothes in the gym.